Spring is almost here and that means Mother’s Day is just around the corner. 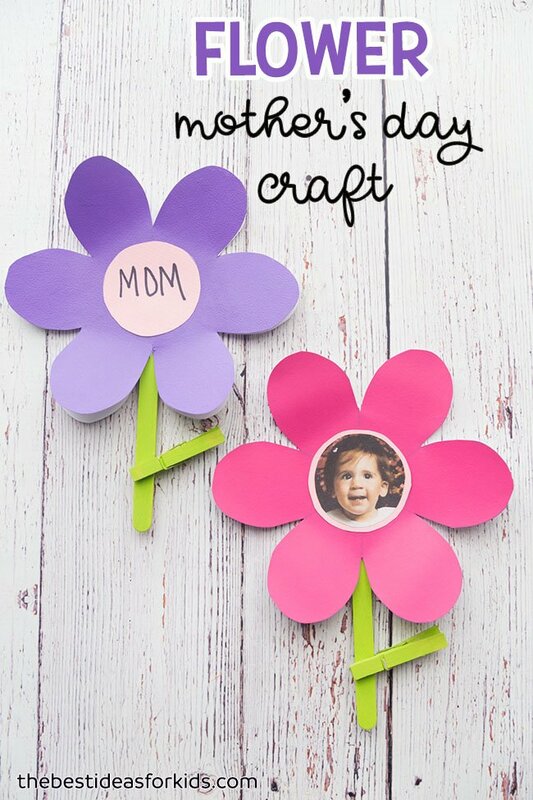 We have a lot of really cute ideas to make for Mother’s Day and this one is no exception! The best part about it is that you can use this flower template in so many ways! 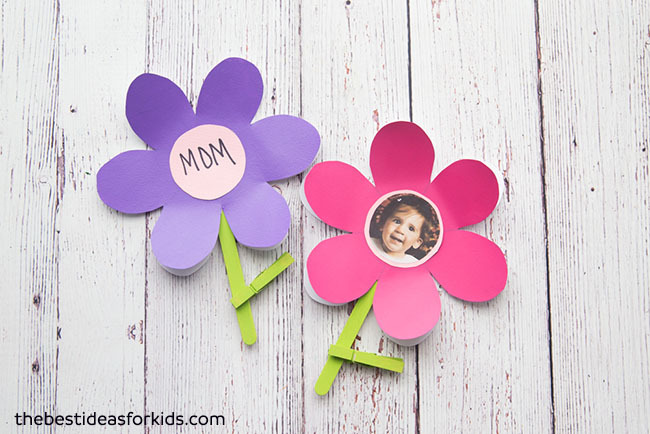 You can simply color and add Mom with words right on it or make this easy and fun flower craft for Mom. 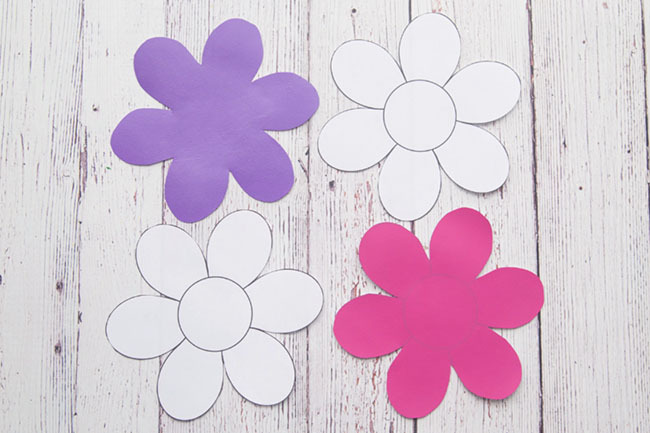 We love that kids can paint or color this flower template on their own! We painted the template because we liked how bright and colorful it made the flowers, but you can also color with pencils, markers or crayons too. 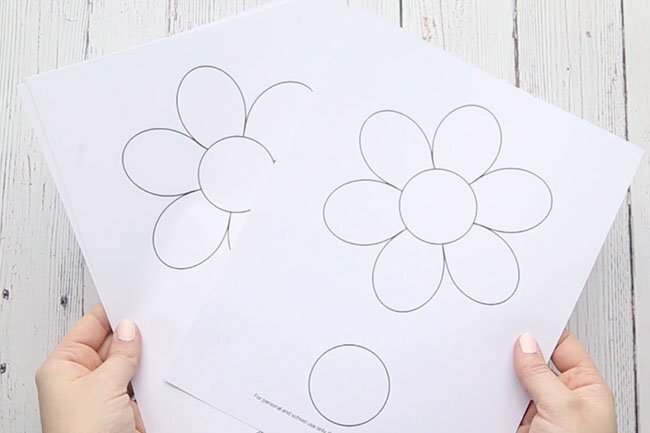 Here is the preview of the free printable flower template – please scroll down to the bottom of this post to get the full resolution PDF you can download. NOTE: Do not print this image – it is low resolution and for presentation in this post only. Scroll down to the bottom of the post to get the full resolution free flower template. Underneath the colored flower is a blank flower where you can write all of your messages to Mom! Younger kids can tell you what messages they would like you to write while older kids can write their own. 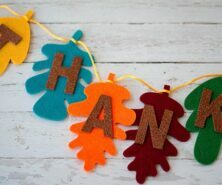 You can even adapt this craft for a best friend, all about me craft, or any other holiday too! 1. First print off our flower template. Grab the full resolution flower template printable at the bottom of this post. You’ll need to print 2 copies. One for the top flower and one for the bottom. Cut out each flower and one circle. 2. Paint or color your flowers! 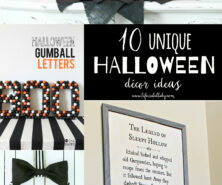 You can also decorate them with stickers, rhinestone stickers, pom poms or any other craft supplies you have on hand. We made two flowers so we need one white flower template for each colored flower. 3. 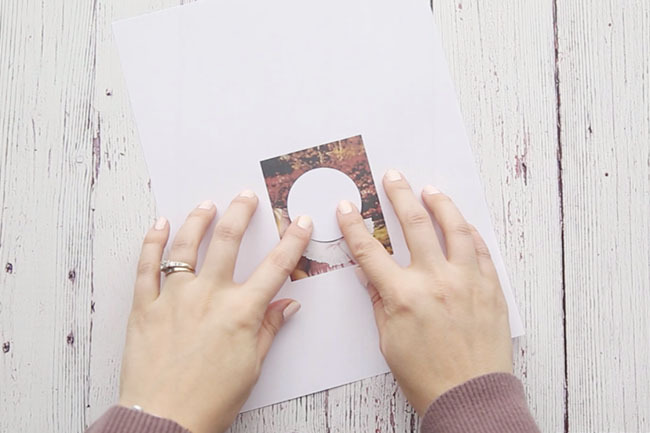 Glue your two templates together by gluing in the center circle part only. Then using the extra circle provided on the free printable flower template, trace around your picture. 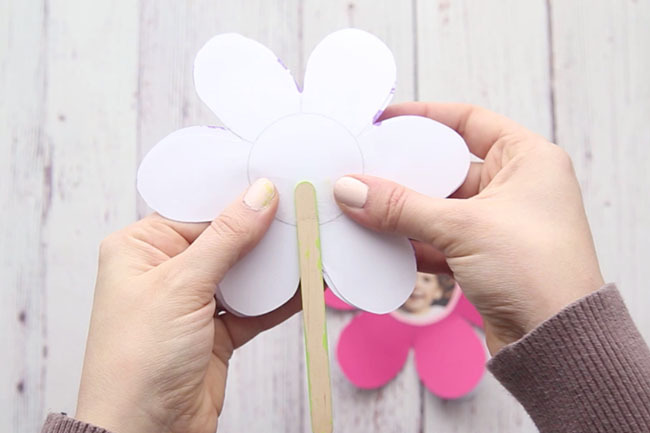 If you want to make it without a picture, use the circle to trace a different colored cardstock for the center of your flower. We also traced an extra pink one to border the picture and then trimmed the picture a little so that the pink border shows through. This is an optional step. 4. Paint your popsicle sticks and clothespins green. Tape or glue the popsicle stick to the back of your flower. 5. Now write your messages inside! 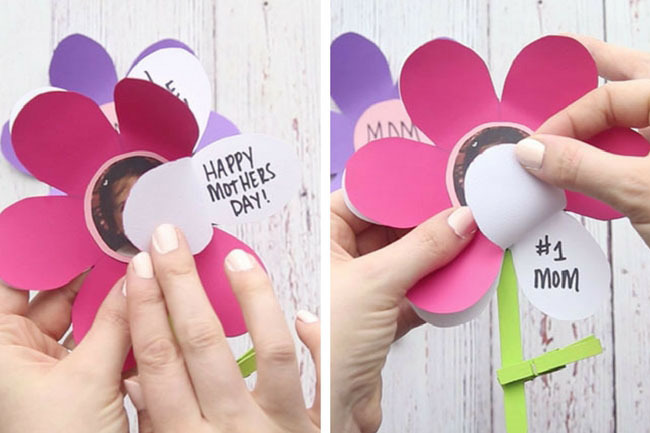 If you are making the flower without the picture, add MOM to center of your flower. 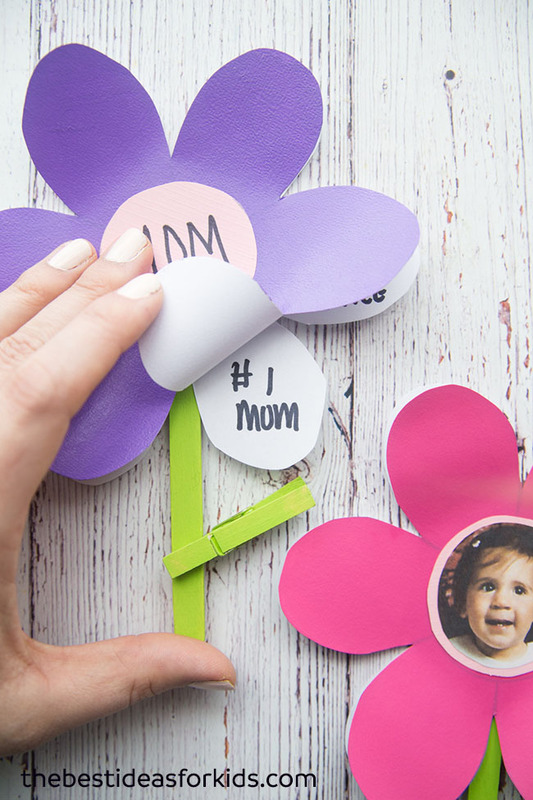 That’s it – we love how simple and fun this easy Mother’s Day craft idea is! 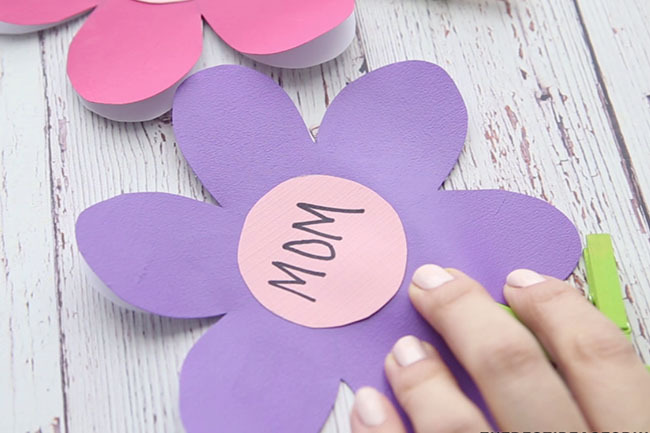 We especially love that kids can write their own special messages to mom too. Mom will love getting this for Mother’s Day! 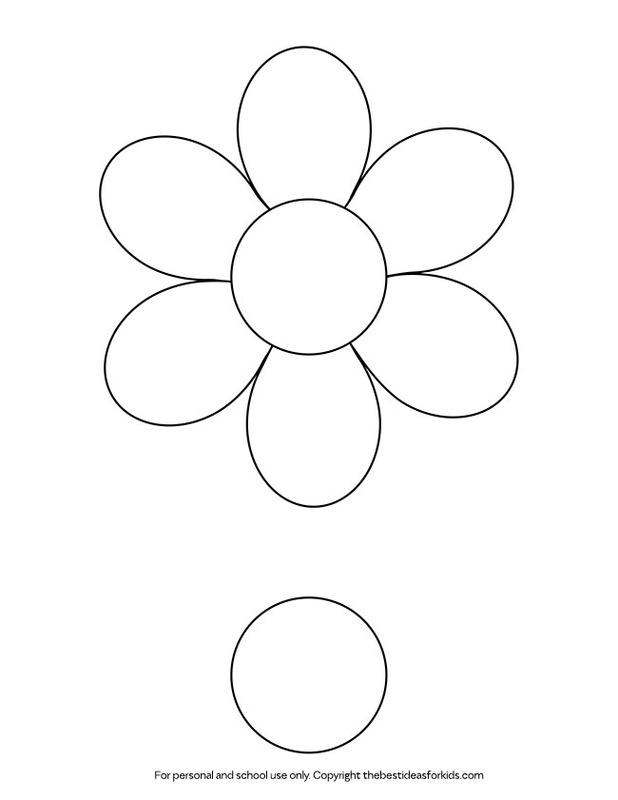 Download your FREE PRINTABLE FLOWER TEMPLATE HERE. 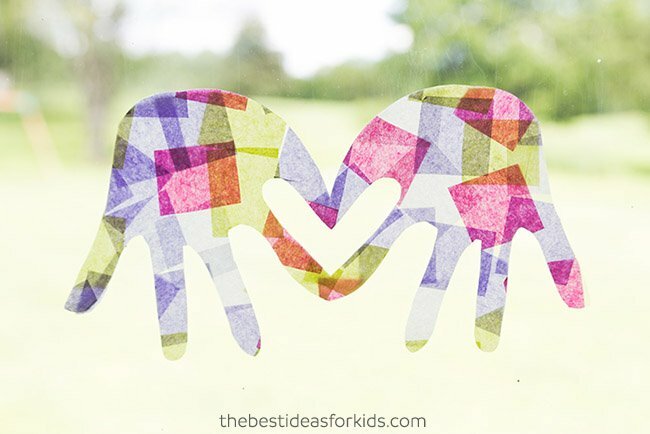 Here are a few more of our favorite Mother’s Day Handprint ideas. 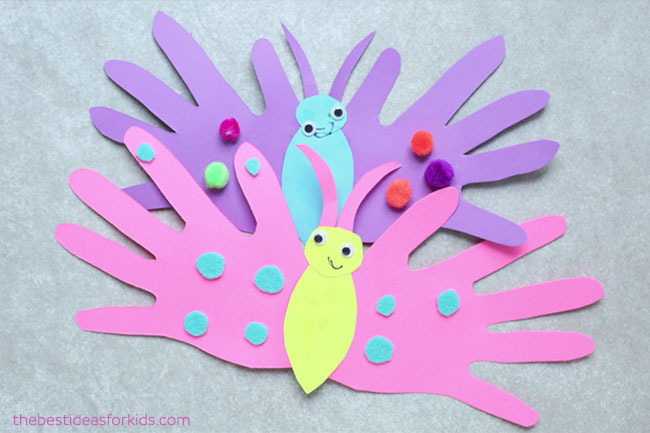 These butterfly handprint cards are really easy and fun to make! Kids will love decorating them. These handprint suncatchers make a beautiful addition to any window! Mom will love to hang these up! 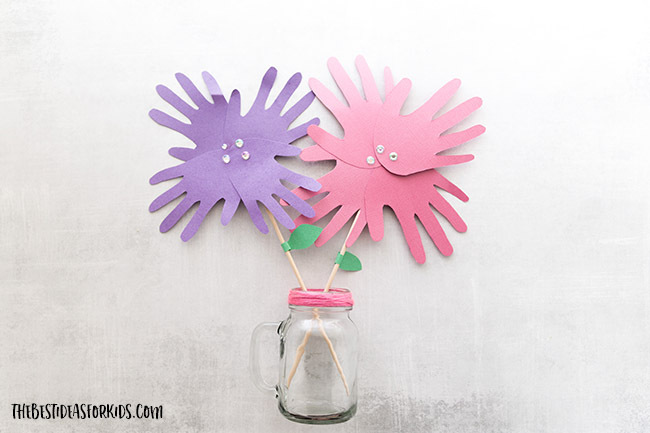 You can even make a handprint flower bouquet! These look so lovely placed in mason jars.